I only had my maternal grandmother living when I was born, and I only saw her every other year when we made the trek down to Texas. As I got older, she was bedridden, so I only saw her for a few minutes out of the whole time we were there. I remember the 1 time I saw her walk: she was in my aunt's kitchen and she got out of her wheelchair, holding onto the counter as she walked. I don't think I was attached to anything as a child...unless it was my thumb! It's still on my hand! Literally: the trees. I live in a neighborhood that has wonderful big trees, but no forest. Figuratively: the forest. Until I get this kitchen redone, there are too many forests out there. I don't like sour things. I don't consider Greek yogurt to be sour, especially if it has fruit or some kind of flavor to it, so I'll go with it as being my favorite. I've never eaten a kumquat. Key Lime Pie is pretty awesome, especially if it's fried! Summer is all but over for me. I go back to work on Tuesday...my kitchen won't be completely done; the measurement for countertops is scheduled on Monday, then it will be 10-12 business days after I view the slab for the installment. With any luck, I'll be able to cook in my new oven before then. I'm linking up with Joyce at From This Side of the Pond for the weekly Wednesday Hodgepodge. You have my sympathies on the kitchen remodel. Been there, done that. It is so hard to live through remodeling. We're almost done! They did a LOT yesterday, so I can see the light at the end of the tunnel! I've never eaten key lime pie and didn't even know anyone fried it! I hope your kitchen gets done without a hitch and that you love the finished project. I love our kitchen, but it probably needs an update after 28 years. This kitchen project has been a true trial in patience. I know I'll love it when it's done...it's just getting to that point! I'm so glad to hear they are finally making progress! How frustrating this whole experience has been. I feel like you lose a little bit of life when you remodel/build a home-ha! Happy cooking though, and it sounds like that will happen soon! I've definitely lost a whole summer! So sorry you won't get to enjoy your new kitchen before going back to work. Darn it anyway. I enjoyed reading your Hodgepodge!! I know! It's been 1 heck of a summer. This kitchen saga has been something else! I am so very sorry. Ugh! I can't believe that you have to go back to work already! The summer flew by, didn't it?! Wow. Wow. The stress of the kitchen plus the stress of getting ready for the school year combined. YIKES. Fried key lime pie? Are you serious? Where can I get this???? Porky's in Marathon, Fl. 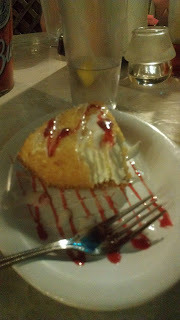 (in The Keys) has the fried Key Lime Pie. I wouldn't go there to eat...terrible service, but in the middle of the day for a piece of pie: definitely worth it! I love key lime pie. I have never had it fried. This sounds good. I think that fried Key Lime pie sounds like it would be pretty awesome. The fried Key Lime Pie is incredible: warm and crunchy on the outside, cool & soft on the inside! We're almost done with the remodel...there IS a light at the end of the tunnel! oh my goodness - fried key lime pie!!! I've never heard of it but it sounds divine!! That is sad about your grandparents. Saw your kitchen up date on Facebook, so sorry....will it ever end! I can't believe you have to go back to work already. That went by too quickly although with the kitchen nightmare it was not the best of times for you! !